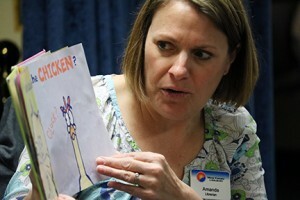 While Amanda loves selecting Mesa County Libraries’ books and movies for youth in her primary job, she also feels lucky because she can carve out a spot to present story time. Readers and non-readers delight in her stories, laughing and singing. First comes fun, then comes purpose. Amanda uses techniques that are known to prepare youngsters to be ready to learn to read. Babies’ brains thrive on talking. They begin acquiring language the moment they are born. Brain development during these early years is mind-boggling, and Amanda knows that reading aloud, talking, and singing with the kids help them build a solid foundation for learning. It is pretty great that she has first peek at awesome books to include in her story times, too. Amanda’s Saturday Story Times are at 10 a.m. every Saturday at the Central Library, Fifth Street and Grand Avenue in Grand Junction. They are open to kids and their families at no charge.